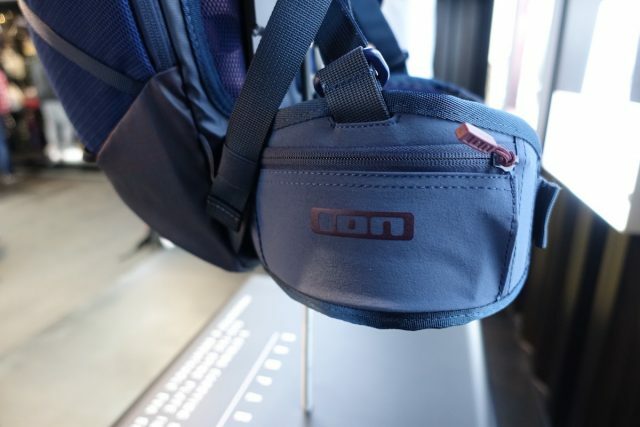 ION Products had an entirely new line of apparel and riding gear to show off at Eurobike, giving everyone a sneak peek at what’s to come for the new season. 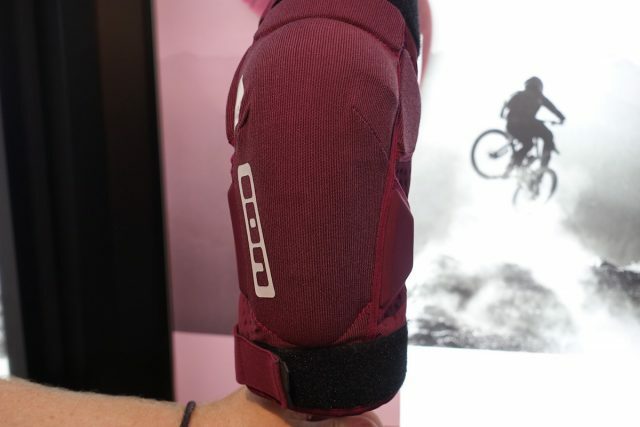 There’s a smattering of new products, including a new pair of flat shoes, some revised knee pads, and a superlight waterproof getup that includes a waterproof-packable over short. 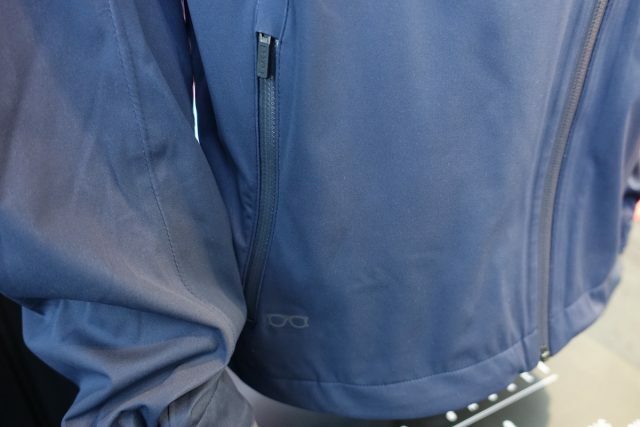 The Vario jacket gets renamed as the Shelter for 2018. 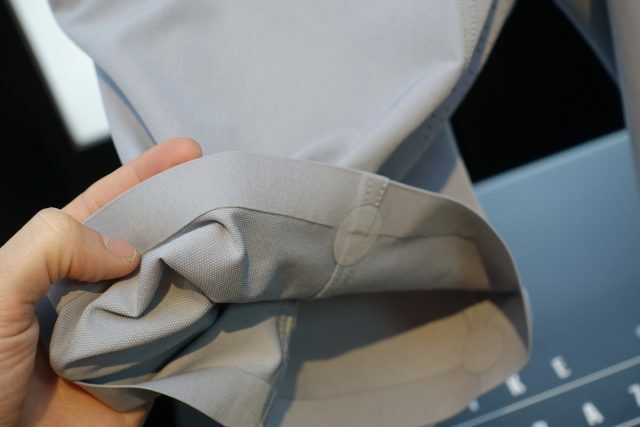 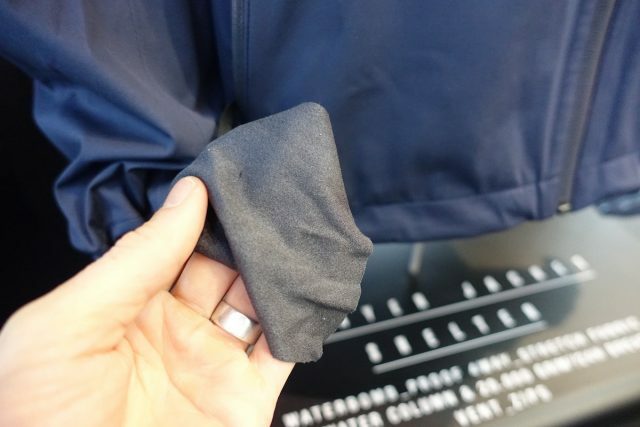 It’s still mega waterproof with a 20,000mm rating, and features 4-way stretch fabric for a flexible fit. 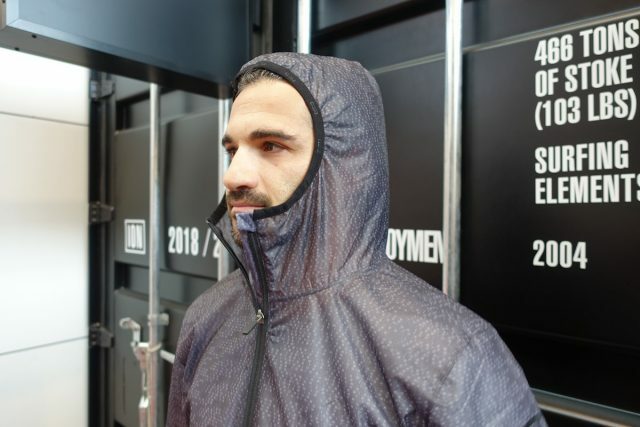 The high neck collar and a waterproof main zipper help to keep the awful out. 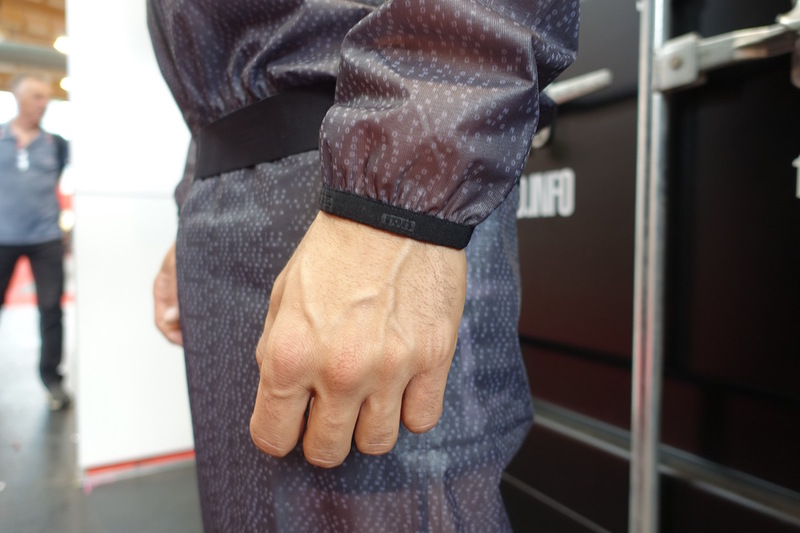 Velcro wrist cuffs to snug down the sleeves. 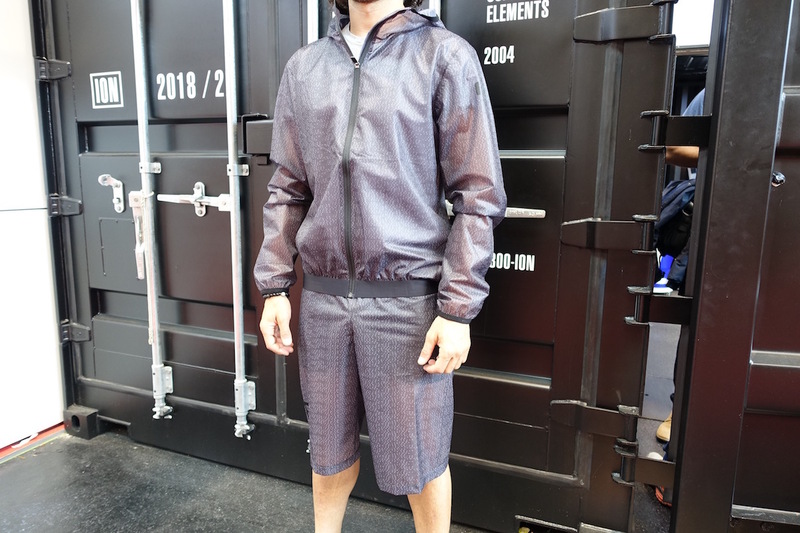 This new packable waterproof getup was one of the highlights from the range ION had at Eurobike. 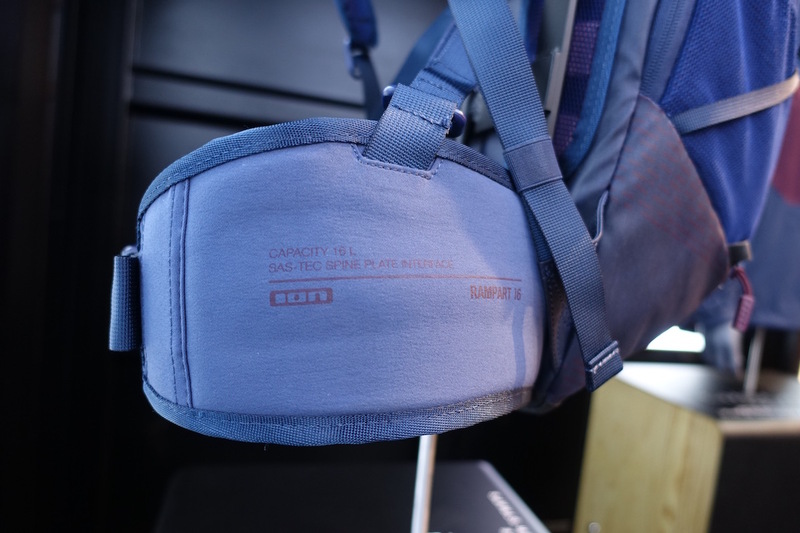 Superlight, and very compact for stashing in a riding pack. 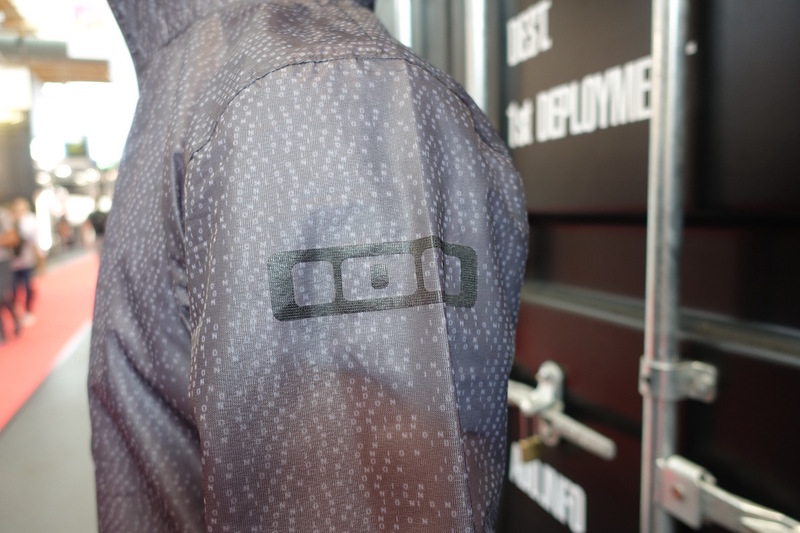 Called the Shelter rain jacket, the fabric used is superlight and slightly opaque. 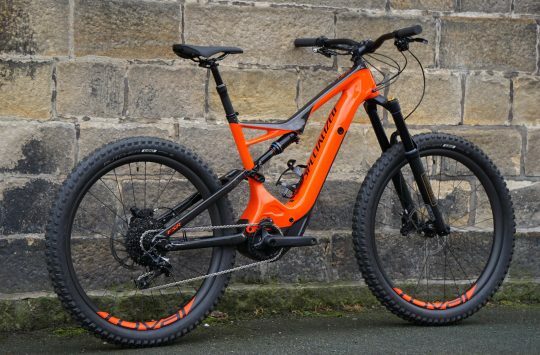 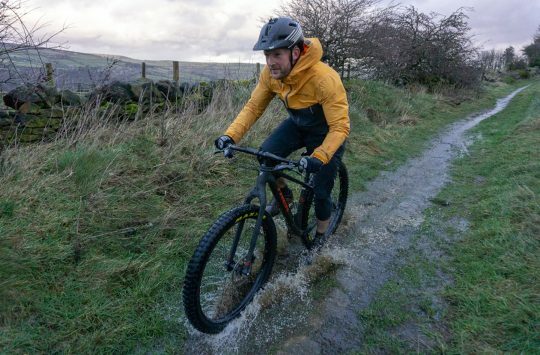 It comes with a 10,000mm waterproof rating, though it’s more of an emergency jacket than a day-in, day-out riding jacket. 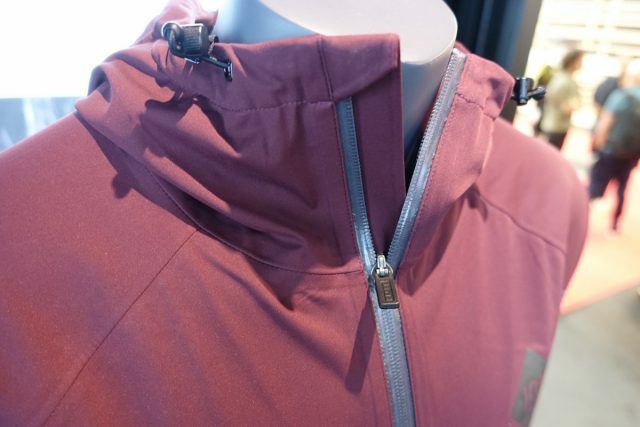 High neck collar and an integrated hood that’ll slide in underneath your helmet. 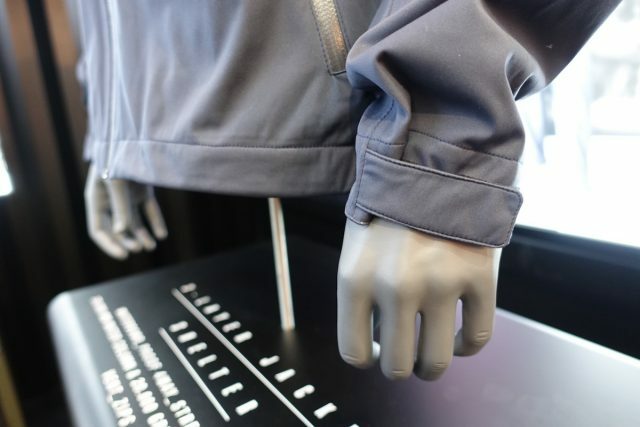 The main zipper is water-tight for keeping the wind and rain on the outside. The jacket is cut long with a nice whale-tail to give your back end spray coverage (from the trail). And an elasticated waist too. 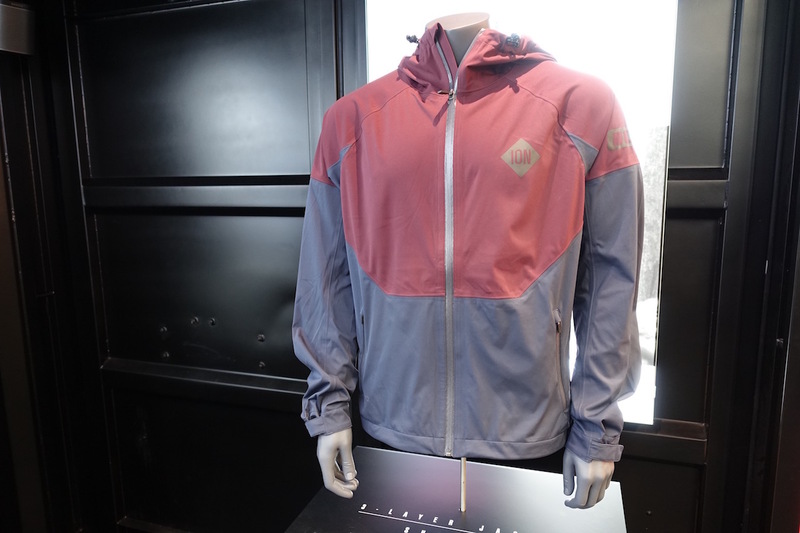 The Shelter Rain Jacket will sell for £94.99. 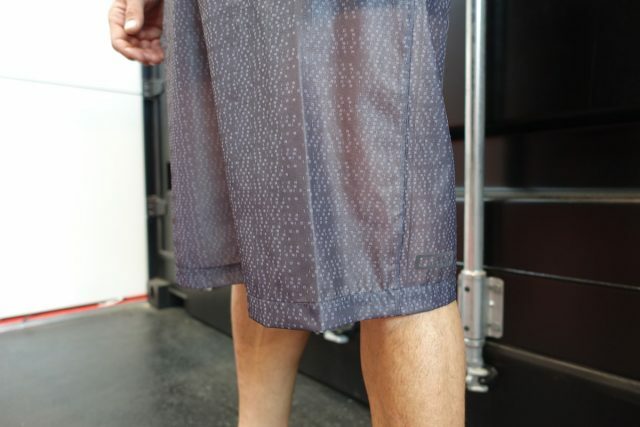 Superlight waterproof shorts are designed to be worn over the top of regular baggies. 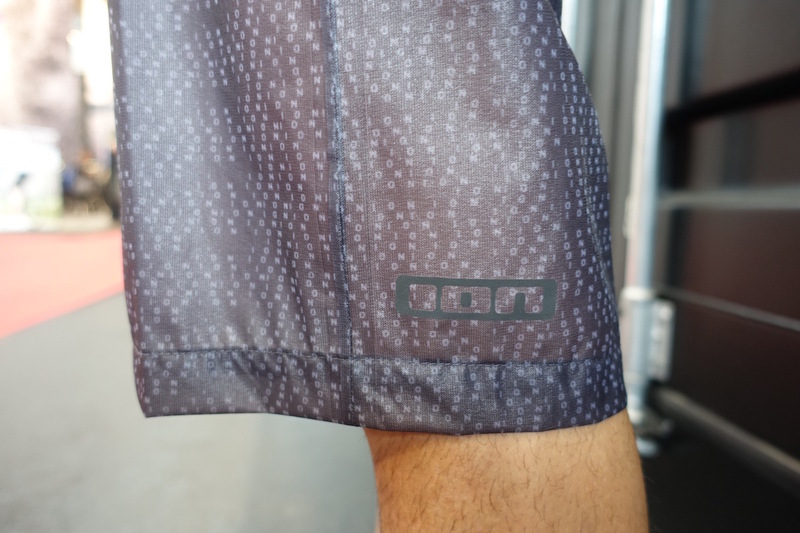 The Shelter Rain Shorts are made out of the same opaque waterproof fabric to make them extremely lightweight and stashable. 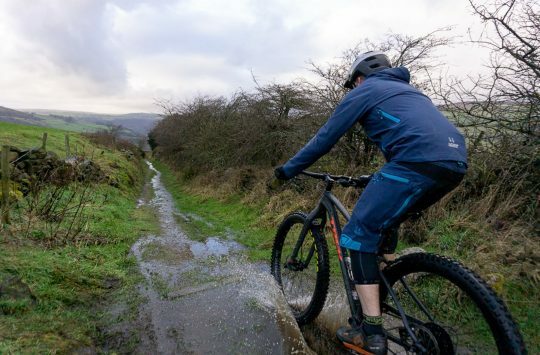 The fabric is unlikely to be tough enough for riding in wet & muddy conditions on a regular basis. Instead, we see these as being an emergency shoulder-season garment that you’d stuff inside your day pack and whip on in the event of a surprise thunderstorm. 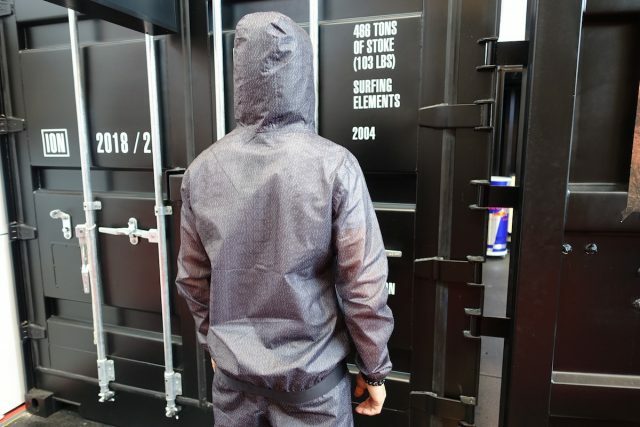 Pricing will be £64.95. 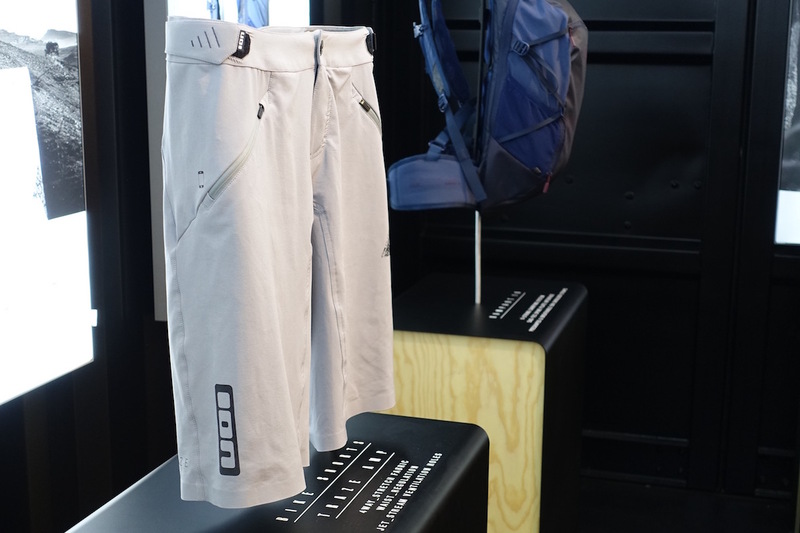 The shorts are low-frills to keep them lightweight and easy to scrunch up for storage. 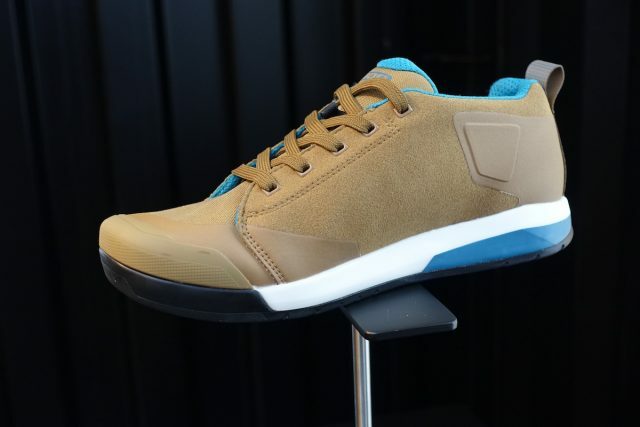 ION released its new footwear range earlier this year, though they’ve got some fresh colourways for 2018, including this new Raid flat pedal shoe. 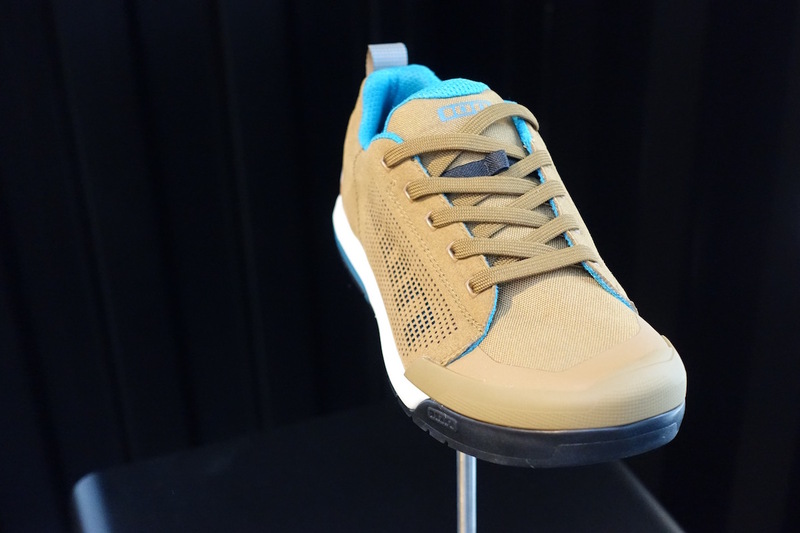 Lace-up design with ION’s casual surf-inspired stylings. Subtle armouring on the inside ankle, along with a reinforced toe box. 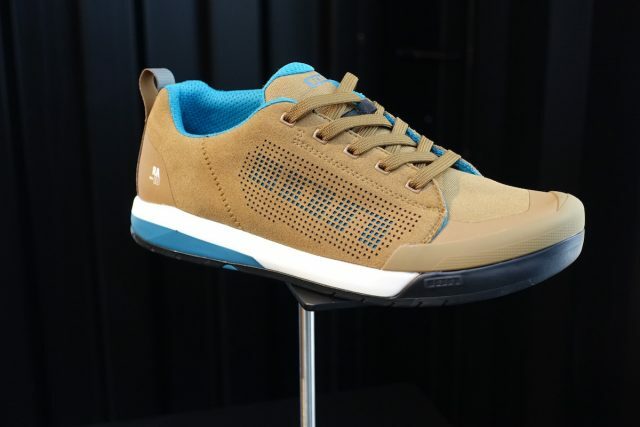 ION collaborated with Suplest for the Raid & Rascal shoes, who helped to develop the SupTraction rubber outsole. 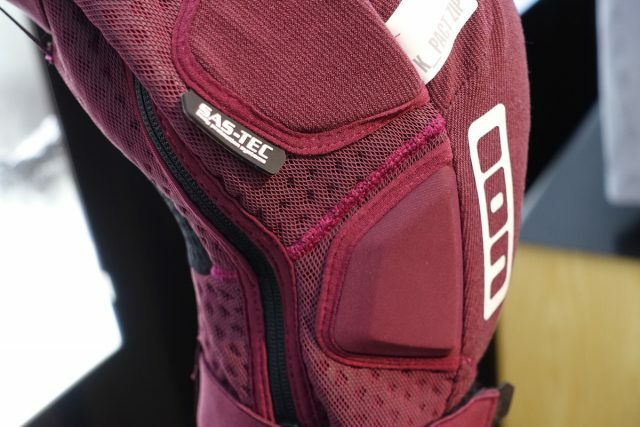 The K_Pact AMP knee pads have been updated for 2018, with some tweaks to fit and materials. You’ll still find SAS-TEC protection for the primary knee cap armour, while additional panels are used for the outside of the knee. A full length zipper allows for quick removal and installation without removing shoes. 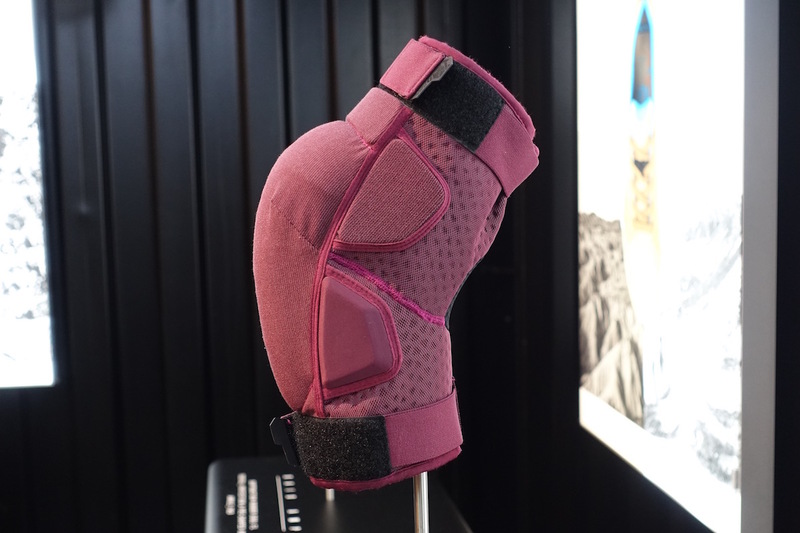 Note the perforated fabric core, which offers a significant step up in breathability compared to the old knee pads, and particularly around the back of the knee. 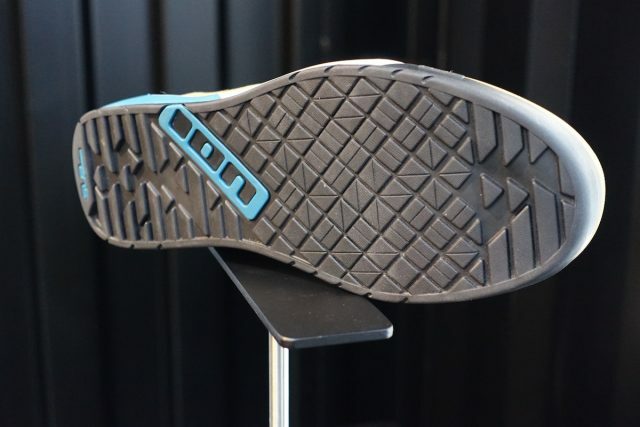 Large velcro straps afford additional retention around the top and bottom cuffs of the knee pad. New Traze shorts get updated to an entirely 4-way stretch fabric for additional comfort and flexibility. 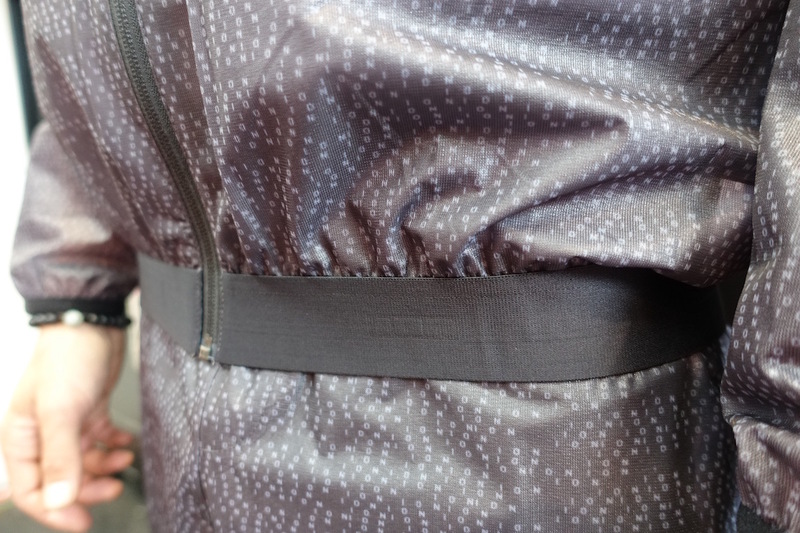 Adjustable waist thanks to a couple of simple velcro fasteners. 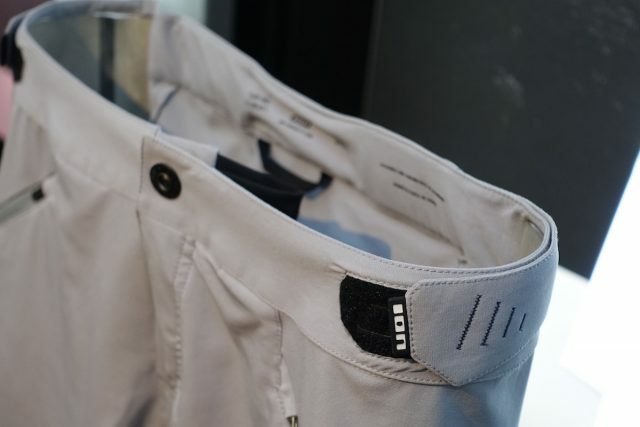 Welded hems reduce stitching and material bulk around the knee. 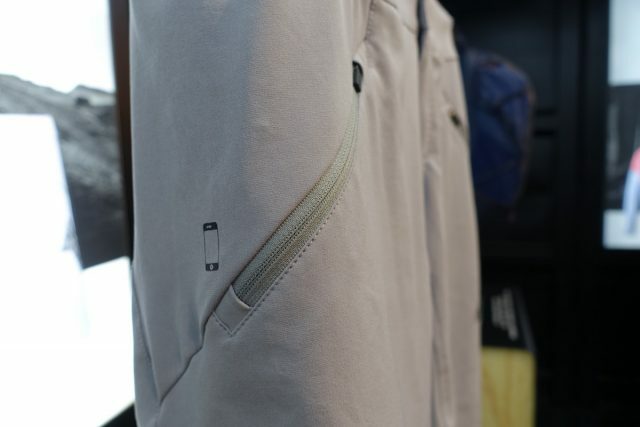 Zippered side pockets are angled to keep phones and phablets secure. 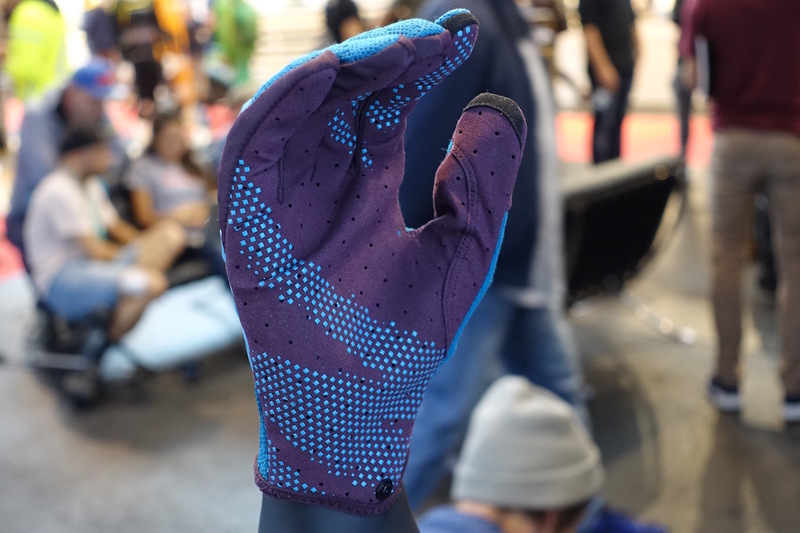 The Gat glove has been completely redesigned for 2018, with a new knitted fabric offering a big jump in breathability. 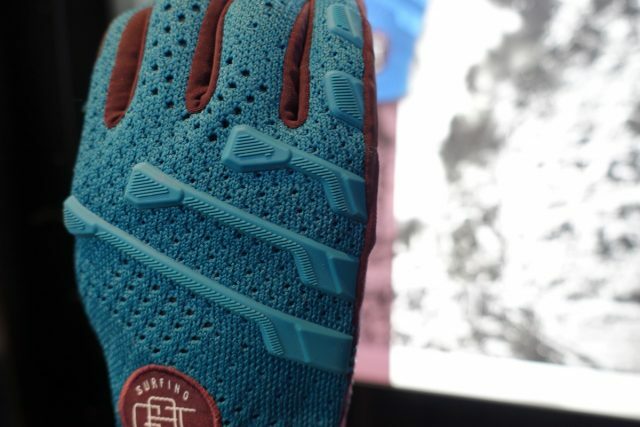 Similar palm as the old version, with silicone detailing for gripping the good stuff. 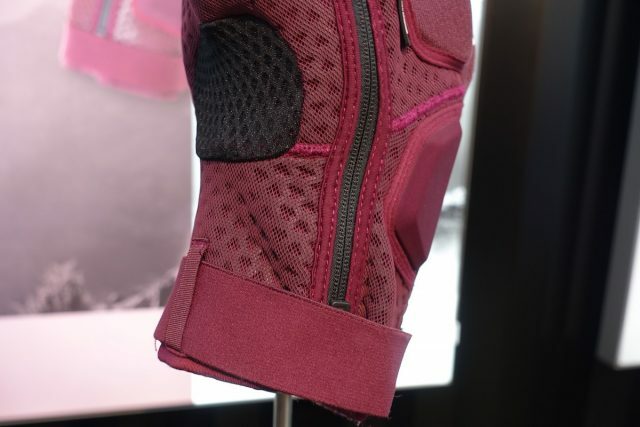 Protective panels are added to the outside of the glove. 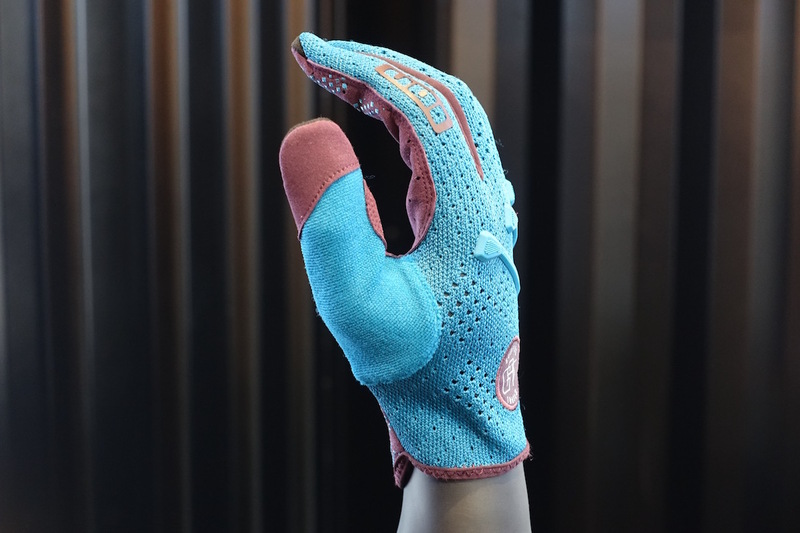 Meanwhile, the knitted fabric is supposedly a natural rip-stop material, while offering loads of little holes for ventilation. 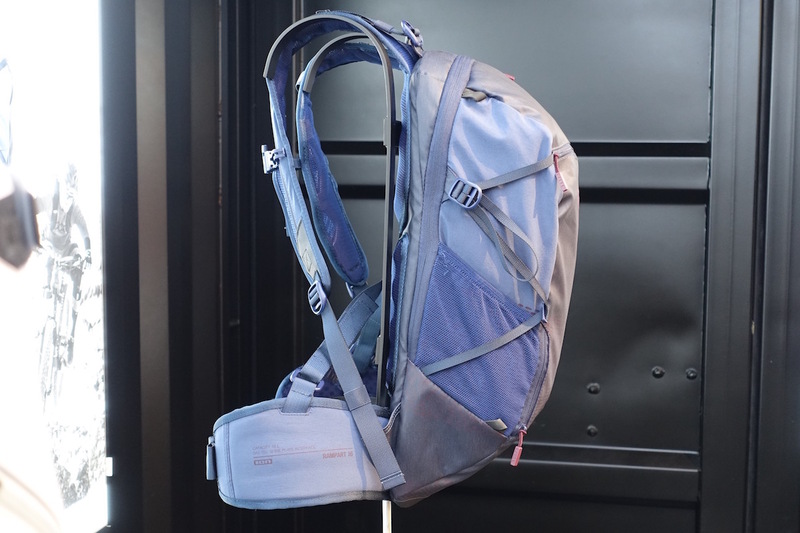 The Rampart hydration backpack is heavily updated for 2018, and comes in both 8 and 16-litre versions. 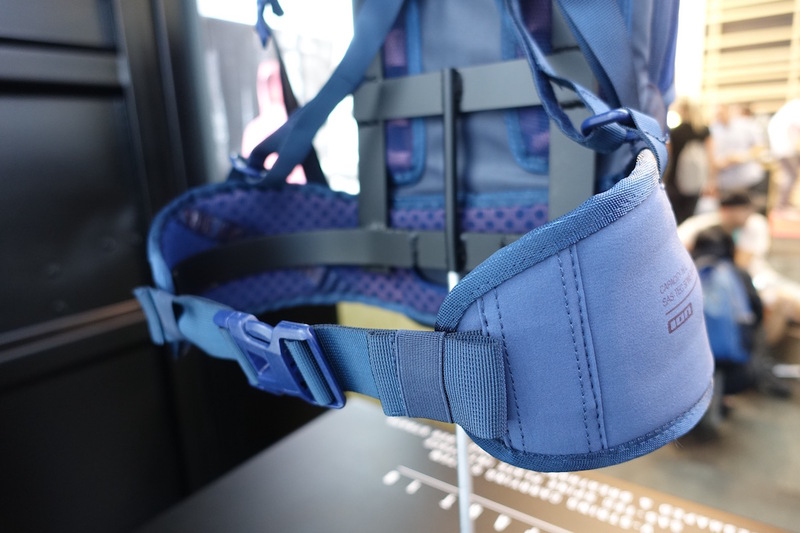 Large profile waist belts help to steady the load, while an internal SAS-TEC spine protector provides additional back protection. The fully adjustable harness features thick but ventilated padding. 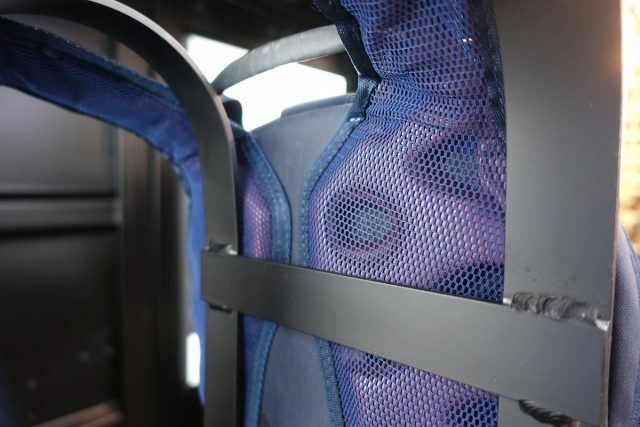 The padded back panel gets a dose of drillium™. Secret zippered stash pocket on the right-side waist belt.